It may look inconspicuous, but it is packed with power. This aluminium box, 140 mm wide, 50 mm high and 100 mm long, houses the telemetry system of the Chiron and maintains communication between the vehicle and Bugatti customer service. Norbert Uffmann, specialist in communications electronics, is responsible for the development of the Bugatti telemetry system. Edouard Klein, Bugatti Flying Doctor, can check the technical data of a customer’s vehicle on the other side of the globe from the company’s headquarters in Molsheim. He is available round-the-clock and ready to take the next flight at any time to provide support for a customer’s vehicle together with the local service partner when the need arises. Bugatti currently has three Flying Doctors. They are supported by a team of highly qualified mechanics at company headquarters in Molsheim, France, as well as 34 dealers and service partners who cooperate with Bugatti throughout the world. Bugatti is the first manufacturer to use telemetry to provide individual support for its customers’ production vehicles. For the Chiron, the luxury brand from France has made considerable further progress with the system. It is now possible to check vehicles throughout the world on a real-time basis. “Our customers have the most demanding requirements for individual support in all areas of their lives. That also applies to their vehicle fleets and automobile collections,” says Malinowski. “In this area too, Bugatti goes one step further than other manufacturers. With our telemetry system, we can provide our customers with assistance in all technical matters related to their Bugatti. At any hour of the day and, if necessary, also of the night.” Bugatti has many years of experience in this field. The super sports car manufacturer already developed this data transmission and analysis system which allows communication between vehicles and customer service for its first modern supercar, the Veyron 16.4. Since 2004, Bugatti has therefore been in a position to monitor the technical status of each individual Bugatti from the company’s headquarters in Molsheim. Norbert Uffmann, who is now responsible for the development of the telemetry system at Bugatti, says: “At that time, we really broke new ground. Bugatti is the first automobile manufacturer to apply telemetry on a production vehicle. And we are still unique in this respect,” adds the 44-year-old communications technician, who holds a degree in electrical engineering, with a certain pride. Ingenieurgesellschaft Auto und Verkehr, a long-standing development partner of Bugatti located in the North of Germany, which has been involved in the system right from the start. The Bugatti telemetry system works mainly using mobile radio and monitors the operating status of each Bugatti. It is “online” round-the-clock seven days per week – provided that the customer’s vehicle is located in an area with mobile phone network. With the launch of the Chiron, far more data can now be acquired and recorded in a variety of different ways – permanently, temporarily with respect to individual events or limited to certain time periods. The system keeps a close eye on about 10,000 signals from all parts of a car, including engine, transmission, lights, air conditioning and infotainment system. As a new feature on the Chiron, the data is transmitted on a real-time basis, something that is normally only experienced with Formula One or DTM racing cars, where the race team mechanics can monitor their cars from the pits. Live data from any location on earth takes no longer than a text message to reach Bugatti. The Bugatti Flying Doctors do not need to closely watch their monitors. If unusual signals are received from a vehicle, the responsible flying doctor receives a message on his mobile phone. This way, Customer Service receives the information needed to provide the best possible support for each Bugatti. This includes prompt answers to customers’ questions over the phone and long-term assessments of vehicles’ behaviour so that the flying doctor can prepare for his upcoming visit to the customer. The highly qualified technicians therefore know in advance which spare parts they need to order, if any, and can immediately place the necessary orders. Bugatti has three flying doctors, who are responsible for vehicles owned by Bugatti customers in the regions of Europe/Russia, the Middle East and Asia/Pacific, and North America. They are supported by mechanics at the company’s headquarters in Molsheim and at the facilities of Bugatti’s 34 dealers and service partners throughout the world. From the moment when a customer takes delivery of a Bugatti, the flying doctor is his direct contact for all technical questions. Often, a close relationship of trust is developed over the years. The flying doctors are available round-the-clock and are ready to board the next aircraft in order to provide customers with the support they need either at the nearest dealer’s workshop or at their homes if it is not possible to provide advice over the telephone or the required results cannot be achieved in this way. The telemetry system allows two-way communication, not only from the Bugatti to the customer service centre but also vice versa. Customer Service can transmit data to the vehicle in order to change configurations or, to a certain extent, to carry out software updates. This sophisticated technology is not packaged in a particularly spectacular way. The Customer Service laptop “talks” to an aluminium box in the vehicle which is only 140 mm wide, 50 mm high and 100 mm long. 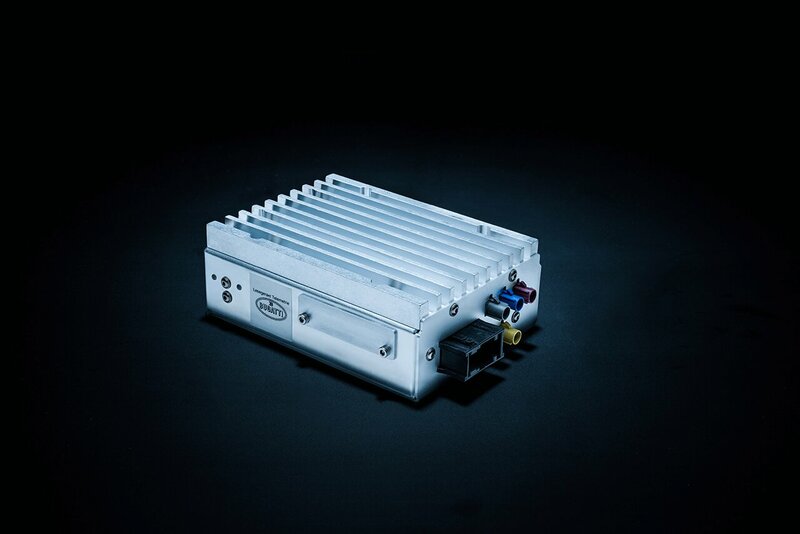 Despite its small size and light weight, the box is packed with power, housing eight vehicle networks such as CAN (Controller Area Network) buses. An on-board network links the various controllers of the vehicle. The control mechanisms, which have greatly increased in number, exchange data as in a telephone conference call. The telemetry box listens in to these communications in an event-controlled way, recording diagnostic information from at least 30 control units in the vehicle and forwarding it in encrypted form to customer service depending on the requests received from Molsheim. In addition to everyday technical support, the tracking of stolen vehicles is a feature of the telemetry system that is highly appreciated by customers. While owners of a Veyron still had to report the theft of their Bugatti to Molsheim personally in order to activate the stolen vehicle tracking system, the Chiron will draw attention to itself automatically using the telemetry system in situations that are unusual for the car, for example if it is transported by truck. Following the successful premiere of the telemetry system for customer service on the Veyron, Uffmann discovered another area of application for the system. “Using the experience we had gained with the Veyron, we already used telemetry in the technical development phase of the Chiron. That was a new approach,” says Uffmann. This way, it was not only possible to test the individual development phases of the new system rapidly in practice; the vehicle developers were also able to provide active support for the various test drives throughout the world. For example, the prototypes were monitored on a real-time basis from Bugatti’s development back office in Wolfsburg. In the case of long-term test vehicles, statistics were prepared and evaluated. This applied both to testing in hot conditions in the USA and to test drives in South Africa. Using this approach, problems could be detected and solved faster. “Telemetry made a key contribution to the development of the Chiron. At the same time, the telemetry system itself was also improved”, the engineer reports. When asked about data protection and security, Norbert Uffmann underlines that this is a top priority. All customers whose Bugattis receive telemetry support have given their consent in advance in the vehicle purchase contract. With only a few exceptions, all owners have given their consent as they see telemetry as the perfect way of providing the all-round service that they appreciate and enjoy using. Data transmission between vehicle and server is effected with individual security certificates depending on the topic concerned. The security certificates are continually updated in line with the latest Volkswagen Group security standards. In the case of Bugatti, only a strictly limited number of highly qualified employees have access to the data. Access rights are also individually defined depending on the topic and the employees concerned.